I posted my 2018 Summer Reading Guide back in May and I told you I’d be adding more books to that list throughout the summer because I tend to find more books perfect for summer as the summer goes on! This is the last crop of books I’ll be adding…and they’re some good ones! After today, The Book of Essie will take over the top slot in the “Something Fun” category from Woman Last Seen in Her Thirties! Coincidentally (or maybe not so coincidentally since I do love the behind-the-scenes of reality TV), two books on this list are set on reality TV shows and do a great job of portraying what goes on behind the scenes of those types of shows. And, two of these are Book of the Month picks! Plot Summary: Sedaris’ latest essay collection focusing on middle age. My Thoughts: David Sedaris is generally known for his dark humor and his ability to make readers sob and laugh hysterically on the same page. Personally, I didn’t cry or laugh hysterically while reading Calypso, but I did chuckle and get sad and appreciate the crap out of his dark humor. I love how Sedaris says things that most people probably think, but are too scared to say out loud. He’s not worried about offending anyone and talks frankly about his own family. 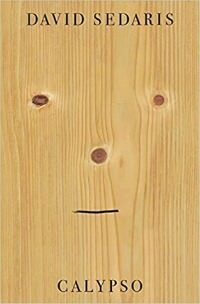 In this collection, Sedaris talks a lot about his sister’s downward spiral and eventual suicide and his father’s aging process and how seeing him age impacts his complicated relationship with him. But, it’s not all serious. He also talks about the outrageous and hilarious…like wanting to feed a tumor he had removed to a special turtle at his beach house. I read one essay a night before bed and was always tempted to keep going for one more essay. And, though I read this one in print, Sedaris is fabulous on audio! My father has done this all his life. You’ll be talking to him and he’ll walk away – not angry but just sort of finished with you. I was probably six years old the first time I noticed this. You’d think I’d have found it hurtful, but instead I looked at his retreating back, thinking, We can get away with that? Yippee! My Thoughts: I needed a fast, easy read after a heavier book and The Banker’s Wife hit the spot! Despite it’s unfortunately domestic sounding title (really…can publishers try for at least one thriller without “Wife” or “Girl” in the title?!! ), it’s more of a conspiracy / financial thriller. It’s purely plot driven (so much so that I forgot to highlight passages to share in this post!) and will keep you turning the pages. There are characters who resemble real life people enough to make you wonder, which I always love to see in my reading (see if you can spot Donald Trump, the Fanjul Family, and the late crime/society journalist Dominick Dunne)! If you’re a sucker for a good conspiracy theory involving powerful people, The Banker’s Wife should be right up your alley! Plot Summary: When the youngest daughter (Essie) of a evangelical reality TV family becomes pregnant and realizes her mother is working with their show’s producers to come up with the best way to spin it for the show, she decides to take matters into her own hands. My Thoughts: The Book of Essie is the type of brain candy I love…a story about weighty topics that reads quickly and easily. The first line will grab you immediately and I was dying to find out how all this was going to turn out. Essie has had enough of the tight leash her family has her on and the glaring media spotlight, so she hatches a plan that involves a male classmate (Roarke) and a reporter with past ties to a religious cult (Liberty). Essie is sneakily subversive and I loved her…she’s someone you can root for. A lot of bad stuff went on with this family, but the story is ultimately hopeful. And though I did have to suspend disbelief at some of Roarke’s decisions, I just went with the story and it was a 100% satisfying vacation read. Bonus: you get an interesting behind-the-scenes look at reality TV and image management in the media spotlight. On the day I turn seventeen, there is a meeting to decide whether I should have the baby or if sneaking me to a clinic for an abortion is worth the PR risk. I am not invited, which is just as well, since my being there might imply that I have some choice in the matter and I know that I have none. Plot Summary: A shocking death occurs during the filming of a Real Housewives-esque reality TV show. 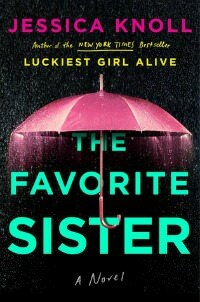 My Thoughts: I DNF’d Knoll’s first novel, Luckiest Girl Alive, but decided to give The Favorite Sister a chance once I heard it was about reality TV. I’m glad I did because it was just the type of brain candy I love: smart, a bit different, and containing an ending that’s surprising, yet makes sense with the story looking back on it. I’ve always been intrigued by how the sausage gets made in reality TV and The Favorite Sister doesn’t disappoint in that department. In addition to the reality TV scoop, you also get a big dose of passive-aggressive sister dynamics, feminism, and motherhood (although she does occasionally get a bit heavy-handed with all the issues). If you read Reality Steve’s blog, liked Bachelor Nation by Amy Kaufman (my review), or love the TV show Unreal, The Favorite Sister is for you! Warning: if dislikable characters ruin books for you, steer clear of this one! We don’t need to draw knives and weapons. The most effective way to destroy someone on the show is to disengage, to deprive her of the drama, of the meaningful connections, of the great and powerful storyline. In our world, your sharpest weapon is a polite smile. What are your best reads of this summer so far? I was on a roll for a while–I loved Mosquitoland and Woman Last Seen in her Thirties. Tell me Lies was really good. Now I’m reading Baby Teeth and it’s probably the creepiest book I’ve read. I don’t think it’s that good but I have to see how it ends. What an evil child! I love reality tv and especially behind-the-scenes stuff, so I definitely want to get to The Favorite Sister and The Book of Essie soon! Oh definitely! They both handle that really well! I loved Calypso and agree about Sedaris on audio. I could really relate to the Fitbit essay. 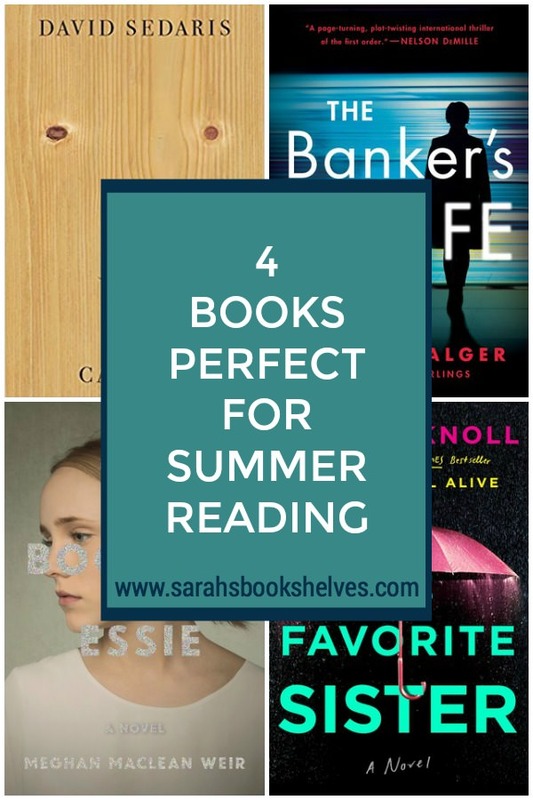 I very much agree that Essie and The Banker’s Wife make perfect summer reading. I haven’t read the other two, but may need to get to them soon since i feel like my reading has fallen a little off track the last few days. Time for some Brain Candy, then! I’ve had the last 3 on my list for a bit. I love reading your reactions to them, especially when they are books that have appealed to both of us. Which we know is not every book. Good job! I’ve actually never read Sedaris (I don’t typically go for books of essays), but I’m thinking I should give the genre a chance. Any recommendations as to which I should go for first? How do you feel about women who just understand women really well? If you like that stuff, then I’d try Tell Me More by Kelly Corrigan. Sedaris is great if you like dark humor. I’m looking forward to reading Calypso and The Book of Essie. I agree about the “Wife” title. I wish we could get away from defining women as chattel or infantalizing them. Yes! And also maybe get a little more creative? Not every book needs to have the same word in the title! I really want to read The Bankers Wife thanks to your review. I really enjoyed The Favorite Sister as it reminded me of season 1 of the NY Housewives. It was a fun book. Thanks to your recommendation for The Book of Essie which I couldn’t put it down. It was so good! So glad to hear that!! I’m hoping for more fiction set in reality TV! I love Sedaris. I don’t think his early stuff is all that dark. But it IS very funny and sarcastic. One of the funniest things I every read was “SantaLand Diaries” about his experience as an elf at Macy’s at Herald Square. Barrel Fever and Naked, his earliest, are hilarious. I’ve got Essie on hold but also on a short leash. Reality TV is definitely NOT up my alley. I think I listened to Santaland Diaries on audio – it was hilarious! I need to listen to more of his stuff…I have Theft By Finding on audio now. 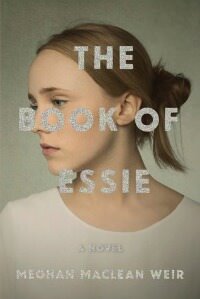 The Book of Essie sounds interesting. I’ve read a lot of good books this summer, but I think the Ember in the Ashes series has probably been the best (if I can count the three books that are already out as one book). 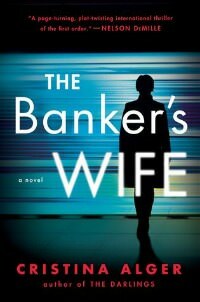 You’ve convinced me to give The Banker’s Wife a try, I like a good plot driven thriller! I have 2 sisters, so the Favorite Sister intrigues me, ha! Thank you for this recommendation!I just finished one that you may appreciate. It’s written in 3 sections– which I wasn’t sure I was going to like but Bochnak did a great job with is. It’s called Fortitude Rising by A.M. Bochnak. I loved the twisty plot, you really didn’t know what was going to happen next.Bochnak, she’s pretty new to the scene so I’ve been tracking her here: http://www.ambochnak.com Happy Reading! Glad to hear you enjoyed The Book of Essie! That one has caught my eye and I also loves books that feel like light reads but still deal with tough topics.